Americana, folk, punk, and a drop of country: Each are genres that could describe Brooklyn singer-songwriter Rue Snider. The New Yorker’s newest effort, Broken Window, is out today (independent, 2016) and without parading a mile long line of fanciful preparatory speak in front, this album is filled with references to drinking, drunkenness, bad decisions, and irrational forms of coping with personal difficulty. Before anyone cries “overused tropes” and moves onto something else, hear this out. 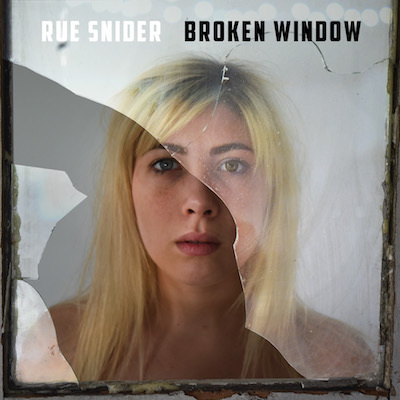 Yes, Broken Window is an album by an Americana/folk (punk) style artist and yes, Snider centers much of his thematic premises around the glass and the bottle. However, the choice to do so is hardly one based in apathetic sub-cultural default. No one who has heard even the slightest of modern pop country would recoil in surprise at the mention of whiskey, or drinking away a break up. Such scenarios are so commonplace for mental imagery in the modern Americana vein that any drama meant to be felt from taking such action has gotten severely lost. Recognizing the reality based place this album comes from is so key because, on the outside, the musical and artistic framing of Rue Snider’s style makes seeing his work “like every other drinking song,” all too easy. The production and instrumental choices of Broken Window, (primarily jangly guitar, fiddle, organ and piano) mixed with Snider’s individual voice, strongly evoke the melodic but painfully shaky character of Conor Oberst, along with the jangling, chime-like guitar melodies of Alt-Americana group, Those Poor Serfs. There’s no questioning the record’s quality of construction or Snider’s consistently emotive performance. The album was recorded and mixed with care and thoughtfulness to be sure. Decisions concerning choices like panning and filtering, both of which shape the way the songs are delivered to the listener, are amply exercised on tracks like “You’ll Be Fine.” Effects like tone bending on standard elements like guitar parts, for tracks like “Denial,” enhance the allusion to an alcohol-induced haze. This song unfolds like a stream of consciousness. Snider’s recollection of the explosion of the space shuttle Challenger stands in as the utterly specific, real-life anchor tethered to what is an otherwise overall musing on the impermanence of human life and the perpetual weight of mortality (Lives are made of minutes, made of seconds / One day will be the last for me, for you.). There’s something that feels almost somewhat guilt inducing about deciding that this very conceptually heavy, very crudely honest, and ultimately sad song, is a standout “must-listen” kind of track for Broken Window. Nevertheless, there it is. Having most everything else around it prior, be very similar melodically, instrumentally, thematically and even narratively (no metaphors for getting drunk here – just straight up getting sh-tfaced), “73 Seconds of Change” is a serious breath of fresh air that hears Snider, yes, still embracing sadness. However, he does so grounded in a factually relatable event that can be explored on one’s own, as opposed to a generalized scenario that needs to have details extracted and subsequently compared to others in order to form an analogous but not identical connection. It’s also a refreshing change for the unique reason that this song, and this song alone, is a bench mark for anyone who listens to it. Depending on one’s generation, absent hearing the introductory date, it’s possible the first thing people might think the actual disaster Snider is alluding to varies, depending on what one remembers as the notably negative event of their generation. Perhaps World War II, perhaps 9/11. In this case, both are wrong and the truth being something that exists in between the two, as well as something not rooted in terrorism, almost makes one step back and reflect on the nature of our core mindsets with regard to great world turmoil in this day and age. The potential for feeling emotionally and mentally drained by this point in Broken Window is most likely high but the winding down of its last trio of songs actually keeps the refreshing surprises going. Broken Window closes on a syncopated, uptempo note, once again, more positive in tone and word. (I want to be there for you like you’ve been there for me…You’re the reason I’ve been thinking / Life might not be a series of disasters.) While a little more push on the poetic and metaphorical side might be an appreciated touch here, after so much downtrodden foot-dragging, it’s great to hear this musical outing take a revived turn in its last 25% and not ultimately pull the rug out from under listeners, as though this happiness hasn’t been earned by both Snider and everyone who made it to the end of the record. The rounding out of the music’s instrumental sound as well – upbeat and major key-centered fiddle, harp, and piano, all reappearing like a cast member reprising on the last number in a Broadway production – really ties Broken Window together, leaving people to take away a sense of hope, joy, and genuine enjoyment that ideally will match that of Snider’s fully realized inner motivation. Broken Window is available now through iTunes, Google Play, Amazon, and streaming on Spotify.